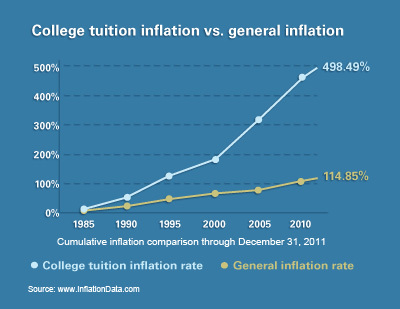 According to FinAid, an online financial aid resource, college tuition has increased at about twice the general inflation rate. On average, tuition tends to rise about 8% per year, which means the cost of college doubles every nine years. For example, the same public college tuition that cost $8,000 in 2003 will set you back $16,000 this year. Over the years, there have been many reasons for the increases in college tuition, but the most recent big hikes at public schools are due—at least in part—to state budget cuts. As state and local higher-education funding decreases, colleges are forced to raise tuition to make up the difference. Families that aren't prepared to cover these costs often turn to student loans in order to afford college. You may also want to evaluate your portfolio's asset mix in terms of the number of years you have to save. For instance, if your child is still in elementary school, you may want to consider a more aggressive portfolio that has a greater allocation to stocks, which have the potential for higher returns and can help you accumulate more money. To get an idea of how much you might need to save, you can use Vanguard's college cost projector. The calculator can project future tuition rates for a college or state that you specify. Or if you're not sure where your student might be headed, the tool will use average costs to calculate your future expenses. *A plan of regular investment does not ensure a profit or protect against a loss.